Whether you’re planning on taking a long road trip soon or just looking for apps to make your daily commute in Greer, SC easier, we’ve compiled some of the best driving apps for smartphones that tell you about traffic, the best stops to make on road trips, and more. Waze is a great app to use if you’re in the middle of a traffic jam. It’s not perfect for longer-term driving because it tends to drain your battery, but it’s great when you’re in heavy traffic because it can suggest an alternate route to take that will get you to your destination faster. For road trips, there’s no better app than Roadtrippers, which suggests places to eat, cool sights to see, the best hotels in the area, and even campgrounds. Plus, if you put your route into the app, it can estimate how much gas you’re going to buy. RepairPal is great to have if you find yourself with car trouble while away from home or if you just don’t have a trusted mechanic in town. It gives you average prices charged by local mechanics and keeps you from overspending. Electric car drivers have to get PlugShare, the app that lets you quickly find charging locations in the area, with more than 40,000 stations registered in the app across the US. With the still limited ranges of most electric cars on the market, PlugShare is a life saver. These are just a few great apps that make driving more fun and stress-free. Find more here! It definitely isn’t too late to look at back to school cars, even if school has already started for you. Labor Day weekend is the Black Friday of auto sales, so save your car shopping for that weekend and get a great deal on one of these perfect cars for students! Head Back to School in a Chevy Spark! A favorite for students is the 2016 Chevy Spark. A tiny subcompact car with great fuel economy, parents will be happy for their teen to drive something easy to maneuver and comes with a small sticker price. 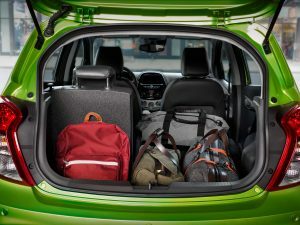 The Chevy Sonic also tends to pop up on back to school lists thanks to its small size, cool styling, and safety-oriented features like Siri Eyes Free. Chevy is also integrating “Teen Mode” into some of its cars, so keep an eye out for that. The 2016 Chevy Malibu has Teen Mode, which lets parents use a PIN to give information to parents about how teens are driving as well as muting the sound system until seatbelts are buckled and even lowers the maximum speed the car can go. If you want to spring for something a little more pricey, the Buick Encore is a fun choice for students. It’s spacious and has plenty of room for your athlete’s gear, but it’s still compact and easy to maneuver. These are just some of the great cars parents and teens can agree on, so if you’re still not sure, ask us more at Bradshaw Automotive!